ww2dbaseCen Zeliu (Wade-Giles: Chen Tse-liu; Cantonese: Shum Tsak-lau) was born in Enping, Guangdong Province, Qing Dynasty China in 1910. He was a graduate from the Central Aviation Academy and then served with the 6th Squadron and then 2nd Squadron of the Guangdong Provincial Air Force. After the Guangdong Provincial Air Force merged into the national Air Force, he was a member of the 8th Pursuit Squadron of the 3rd Pursuit Group, flying Italian-built CR.32 fighters. In the early months of the Second Sino-Japanese War, he was promoted to command the 17th Pursuit Squadron of the 5th Pursuit Group. His first victory came on 26 Apr 1938 when he and his wingman Lieutenant Chu Chun-chiu, both flying Soviet-built I-15bis fighters, shared the credit for downing the G3M bomber piloted by Lieutenant Commander Jiro Tokui near Wuhan, Hubei Province, China. On 29 Apr, he shot down another G3M bomber using a half-roll diving technique he had developed. 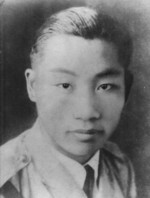 On 20 May, while leading the 17th Pursuit Squadron toward Lanfeng, Henan Province, China for a strafing attack on Japanese ground positions, his squadron was jumped by Japanese Ki-27 and Ki-10 fighters; Cen and Lieutenant Ma Kwok-lim were the only two who were able to escape the fate of being shot down or being forced to crash land. In Sep 1938, the 17th Pursuit Squadron was transferred to Lanzhou, Gansu Province, China for re-equipping and re-training. On 20 and 23 Feb 1939, he led the squadron in the defense of Lanzhou against attacks by Japanese Army 98th Wing and then 60th Wing and 12th Wing; he shot down a BR.20 bomber during the first attack and helped in the downing of others on the second day. On 11 Jun 1939, he claimed his first and only night victory after damaging a Japanese bomber with the help with search lights and finding a wreckage on the ground on the next day. On 4 Nov 1939, he shot down the G3M bomber carrying the commanding officer of Japanese 13th Air Group Captain Kikushi Okuda, who became the highest ranking Japanese Navy air officer to be killed in the war thus far. Cen was hit by return fire, however, and was forced to bail out. In 1940, he was promoted to be the deputy commanding officer of the 5th Pursuit Group. ww2dbaseIn war time, pilots in air forces around the world pursued victories for medals and for personal glory, but Cen was one of the exceptions. Even though Chinese Air Force officially evaluated his score to be five victories by the end of 1940, he had pursued only the Star Medal 8th Class (also known as the Two Star Medal), which was awarded for pilots who had achieved two victories. Fellow pilot Xu Zhixiang (Wade-Giles: Hsu Chi-hsiang), later the co-founder of the Chinese-American Composite Wing, noted that "Cen did not have a shred of selfishness in him". ww2dbaseOn 14 Mar 1941, Cen flew an I-15III fighter during a Japanese attack on Shuangliu Airfield, Chengdu, Sichuan Province, China. He was shot down and killed when he was attacked from above by an A6M Zero fighter. He was posthumously promoted to the rank of colonel. He left behind his wife, Luo, and two children. 15 Aug 1937 Cen Zeliu, flying a CR.32 fighter, pursued and damaged a Japanese bomber south of Nanjing, China alongside of his flight leader Lieutenant Harry Low, but failed to shoot it down. 8 Sep 1937 Cen Zeliu dropped small bombs at Japanese armored cruiser Izumo near Shanghai, China; the bomb missed the target. 8 Mar 1938 Cen Zeliu strafed Japanese ground positions at Fenglingdu, Shanxi Province, China. 26 Apr 1938 Cen Zeliu and wingman Lieutenant Chu Chun-chiu, flying I-15bis fighters, gave chase to the Japanese G3M bomber (Lieutenant Commander Jiro Tokui) which had just conducted a single-plane bombing mission on Xiaogan Airfield near Wuhan, Hubei, China. They shot down the bomber six miles northeast of the airfield. 29 Apr 1938 Cen Zeliu, flying an I-15bis fighter, shot down a Japanese G3M bomber over Hankou, Hubei Province, China. 20 May 1938 Cen Zeliu led a flight of I-15bis fighters on a ground strafing mission near Lanfeng, Henan Province, China. They were intercepted by Japanese Ki-27 and Ki-10 fighters, which shot down 8 Chinese fighters and forced 2 to crash land. Only Cen and Lieutenant Ma Kwok-lim escaped from harm. After returning to base, ground crew counted more than 100 machine gun bullet holes on his aircraft. 12 Feb 1939 Cen Zeliu, flying an I-15bis fighter, damaged a Japanese aircraft over Lanzhou, Gansu Province, China. 20 Feb 1939 Cen Zeliu, flying an I-15bis fighter, shot down a Japanese BR.20 bomber over Lanzhou, Gansu Province, China. 11 Jun 1939 Cen Zeliu, flying an I-15bis fighter, damaged a Japanese G3M2 bomber over Chengdu, Sichuan Province, China. 4 Aug 1939 After sundown, Cen Zeliu, flying an I-15bis fighter, claimed a Japanese bomber over China. 4 Nov 1939 Cen Zeliu led seven D.510 fighters to intercept a group of Japanese bombers attacking Chengdu, Sichuan Province, China. He shot down the G3M bomber carrying commanding officer of 13th Kokutai Captain Kikushi Okuda, but his D.510 fighter was damaged by return fire, forcing him to bail out. 14 Mar 1941 Cen Zeliu, flying an I-15III fighter, was shot down and killed by an A6M Zero fighter over Shuangliu Airfield, Chengdu, Sichuan Province, China. does anyone know more about Capt Ma Kwok-Lim? I know he was Chinese-Canadian but does anyone have more info about him? does anyone have any further information on Ma Kwok-Lim? I know he was originally from Canada but I don't know more than that.